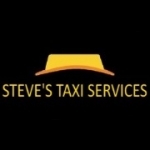 If you are looking for a reliable and friendly local taxi service then look no further than Steve's Taxi Service. We offer a door to door service at very competitive prices so you can relax and enjoy yourself in the comfort of knowing you are in safe hands. If you are on a budget and need to know the cost beforehand, our friendly staff will provide you with a quote over the phone. We are available for pre bookings 24/7 so whatever the time just give us a call. Are you planning a holiday and worried about getting to the airport on time? We offer a taxi hire for the day. We will take you to your destination wait until you are ready to go home and take you back. We will pick you up from home, help you with your luggage and make sure that you catch that flight in plenty of time. We will also come and pick you up from the airport when you get home. We also offer seaport runs so wherever you are planning on going we are happy to get you there in comfort and style. To book now or find out more information call us or simply fill in the contact form. Are you planning on a day trip away with family or friends? We offer a taxi hire for the day. We will take you to your destination wait until you are ready to go home and take you back. We offer very reasonable rates on all of our taxi services. Great for airport runs and around town! Always on time and reliable!!! Steve is absolutely the best taxi service round here! 1 St class service. Comfy car and all round great guy! Nice to see someone who will go that extra mile for a customer !